Inspired by the Mojo Monday Sketch Challenge, I created my card using stamps from Artistic Outpost along with Bo Bunny pattern papers. All images are stamped in Black Archival. I stamped portions of the ledger stamp from the Ephemera Backgrounds on the larger pattern paper background, then used a SAMJ to add the "post card" from this same set and the building from the Paperboy set onto the smaller piece of pattern paper. The college behind the paperboy was stamped using the "guy collage" stamp from the Generation Redux stamp set, being careful not to actually stamp the guys. The paperboy was is stamped on Vanilla card stock, cut out then I applied distress ink to color his sweater, sponged the edges and adhered to the stamped background. The words are stamped on scraps of the pattern paper and adhered to Black card stock. 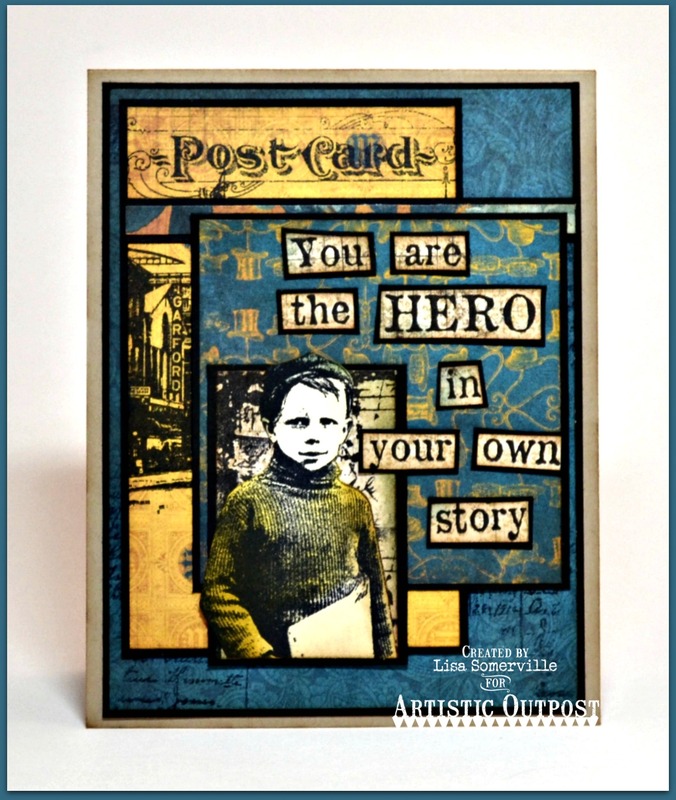 I do love this, your layout, colors and combo of stamps. So fabulous! Thanks for playing along with Mojo Monday! This is a beautiful layout and wonderful use of the sketch!! I love the sentiment.